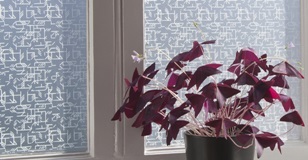 The Window Film Company sell an unrivalled range of window films for home office, conservatory or commercial premises. Whether you need mirror effect film for solar control, privacy frosted window film, decorative films for glass partitions or stained glass window coverings, we have a range to suit. 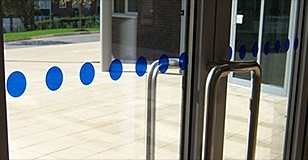 Our high quality window tinting films are applied in a similar way to adhesive vinyl, a bit like sticky back plastic or glass window film stickers. When applied to your bathroom window, for example, our adhesive frosted films give the effect of frosted glass, offering style and privacy. 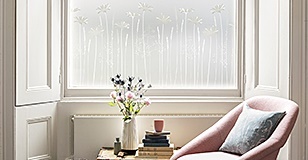 We're always adding more and more window films to the online store, among our latest products are a range of spring flower window film designs. 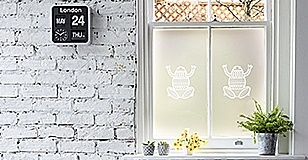 Buy window film online today and easily apply to virtually any glass window or door you wish. Each order includes written step by step instructions, and you will also receive a free plastic squeegee for use when installing your film.